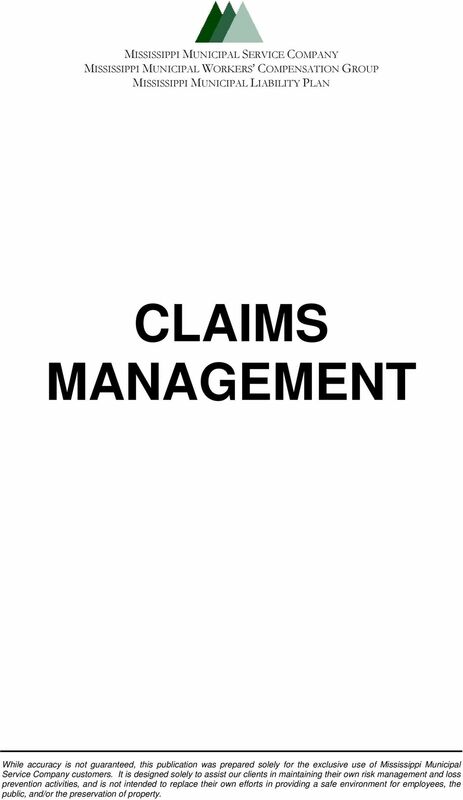 Download "CLAIMS MANAGEMENT MISSISSIPPI MUNICIPAL SERVICE COMPANY MISSISSIPPI MUNICIPAL WORKERS COMPENSATION GROUP MISSISSIPPI MUNICIPAL LIABILITY PLAN"
1 CLAIMS MANAGEMENT While accuracy is not guaranteed, this publication was prepared solely for the exclusive use of Mississippi Municipal Service Company customers. It is designed solely to assist our clients in maintaining their own risk management and loss prevention activities, and is not intended to replace their own efforts in providing a safe environment for employees, the public, and/or the preservation of property. The Seubert Safe Workplace The Seubert Safe Workplace is a program initiated to help our commercial insurance clients their control worker compensation costs and improve employee health and well-being. The ACCG Claims Office staff is here to help you. Please feel free to call us with your questions and concerns. Workers Compensation. 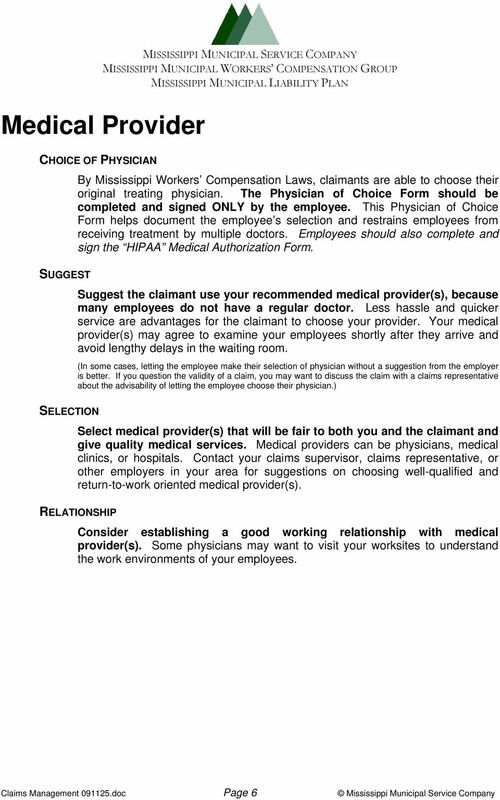 Here s what you need to know about: If you are having health problems because of your job, you have a right to benefits. 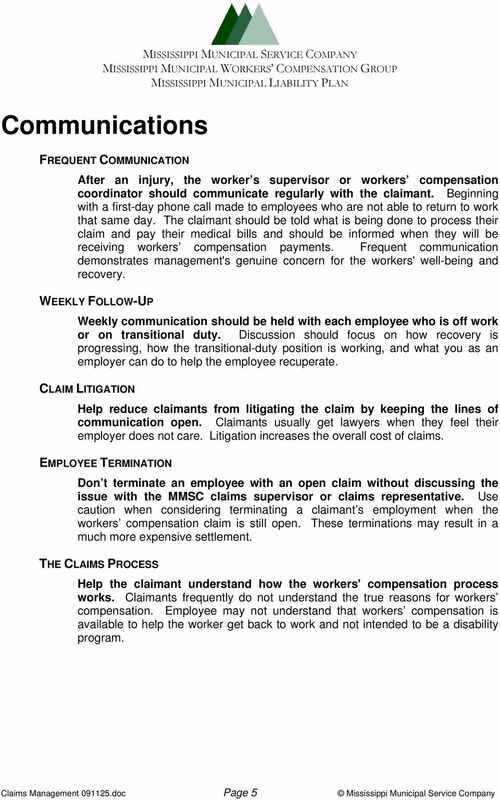 Workers Compensation 101. 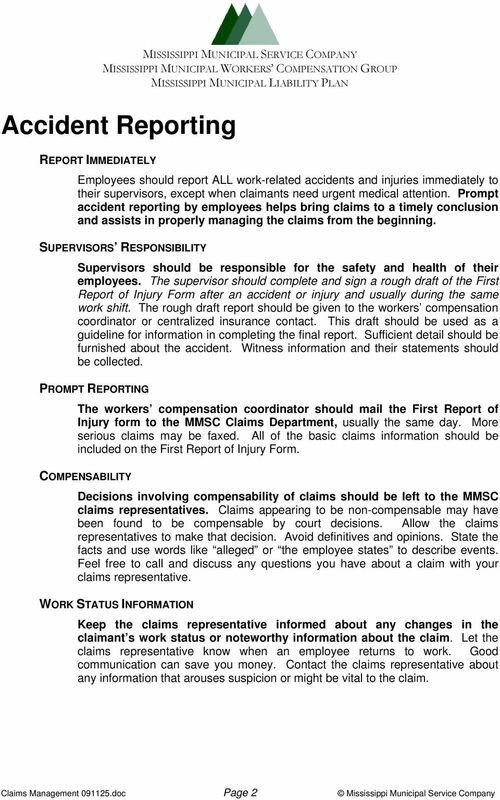 Jess Baker, Workers Compensation Claims Consultant LMC Insurance & Risk Management 515-453-9369 jess.baker@lmcins. The employee s files contained a post office box number instead of a street address. 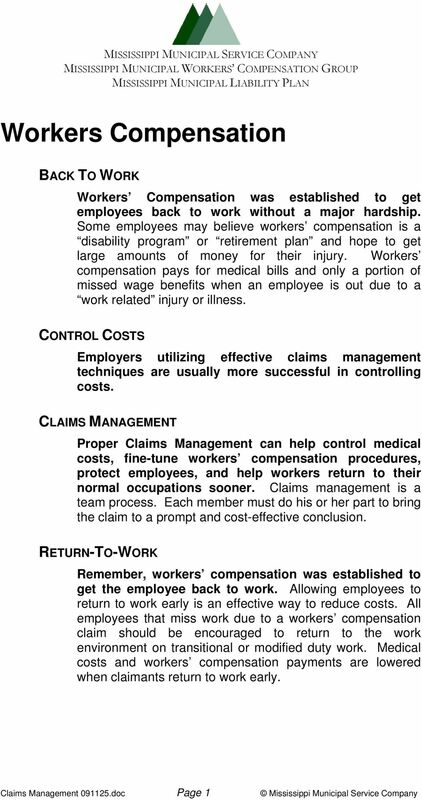 Federal Employees Compensation Act FAQS for Supervisors. 1. 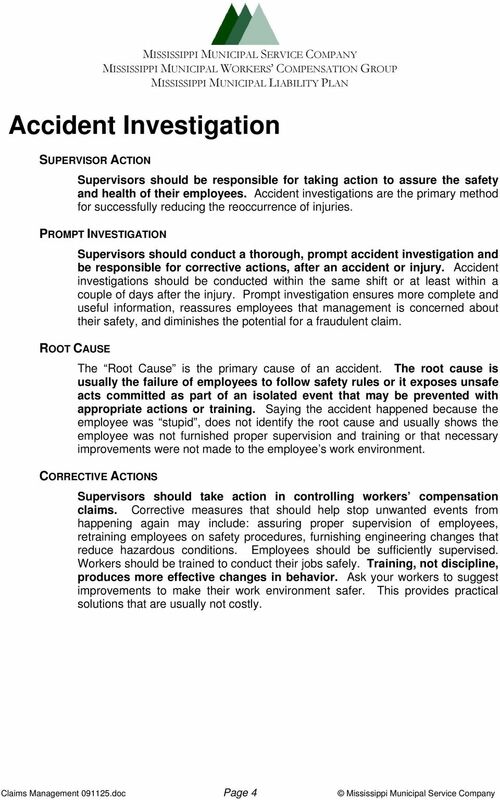 What should you do if you are a supervisor of an injured employee? 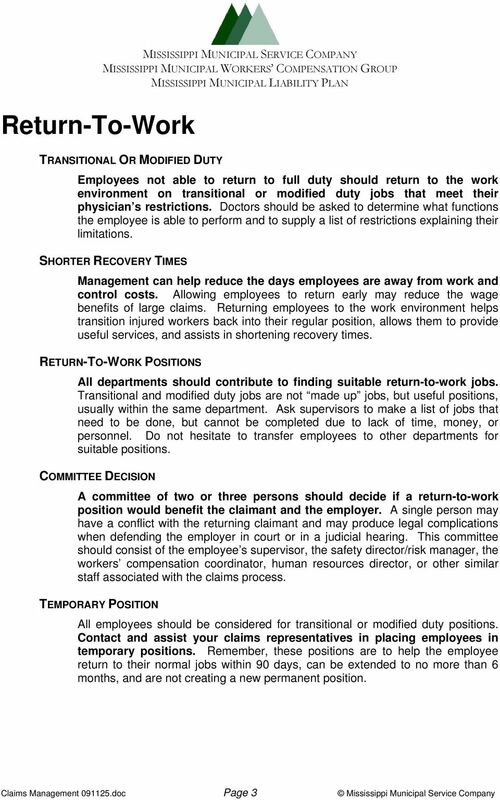 Return to Work Program Guidelines Prepared by the Division of Human Resources Benefits Administration July, 2011 1 P a g e TABLE OF CONTENTS I. TITLE 3 II. AUTHORITY.. 3 III. STATEMENT OF POLICY 3 IV. What Benefits Are Available In A Georgia Workers Compensation Claim? Ty Wilson Attorney At Law 1-866-937-5454 www.tywilsonlaw.